(Nanowerk News) MIT chemical engineers have designed tiny particles that can “steer” themselves along preprogrammed trajectories and align themselves to flow through the center of a microchannel, making it possible to control the particles’ flow through microfluidic devices without applying any external forces. Such particles could make it more feasible to design lab-on-a-chip devices, which hold potential as portable diagnostic devices for cancer and other diseases. These devices consist of microfluidic channels engraved on tiny chips, but current versions usually require a great deal of extra instrumentation attached to the chip, limiting their portability. Much of that extra instrumentation is needed to keep the particles flowing single file through the center of the channel, where they can be analyzed. This can be done by applying a magnetic or electric field, or by flowing two streams of liquid along the outer edges of the channel, forcing the particles to stay in the center. The new MIT approach, described in Nature Communications ("Engineering particle trajectories in microfluidic flows using particle shape"), requires no external forces and takes advantage of hydrodynamic principles that can be exploited simply by altering the shapes of the particles. 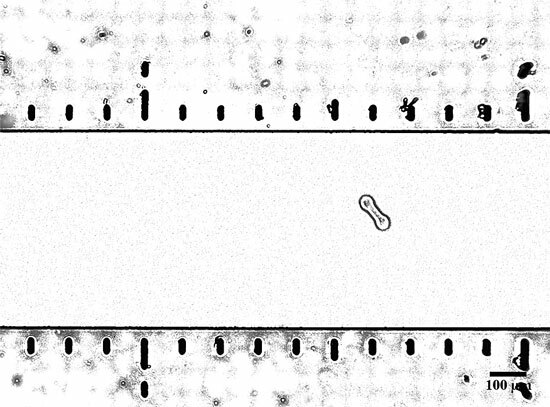 A slightly asymmetrical particle flows along the center of a microfluidic channel. Lead authors of the paper are Burak Eral, an MIT postdoc, and William Uspal, who recently received a PhD in physics from MIT. Patrick Doyle, the Singapore Research Professor of Chemical Engineering at MIT, is the senior author of the paper. The work builds on previous research showing that when a particle is confined in a narrow channel, it has strong hydrodynamic interactions with both the confining walls and any neighboring particles. These interactions, which originate from how particles perturb the surrounding fluid, are powerful enough that they can be used to control the particles’ trajectory as they flow through the channel. The MIT researchers realized that they could manipulate these interactions by altering the particles’ symmetry. Each of their particles is shaped like a dumbbell, but with a different-size disc at each end. When these asymmetrical particles flow through a narrow channel, the larger disc encounters more resistance, or drag, forcing the particle to rotate until the larger disc is lagging behind. The asymmetrical particles stay in this slanted orientation as they flow. Because of this slanted orientation, the particles not only move forward, in the direction of the flow, they also drift toward one side of the channel. As a particle approaches the wall, the perturbation it creates in the fluid is reflected back by the wall, just as waves in a pool reflect from its wall. This reflection forces the particle to flip its orientation and move toward the center of the channel. Slightly asymmetrical particles will overshoot the center and move toward the other wall, then come back toward the center again until they gradually achieve a straight path. Very asymmetrical particles will approach the center without crossing it, but very slowly. But with just the right amount of asymmetry, a particle will move directly to the centerline in the shortest possible time. “Now that we understand how the asymmetry plays a role, we can tune it to what we want. If you want to focus particles in a given position, you can achieve that by a fundamental understanding of these hydrodynamic interactions,” Eral says. In 2006, Doyle’s lab developed a way to create huge batches of identical particles made of hydrogel, a spongy polymer. To create these particles, each thinner than a human hair, the researchers shine ultraviolet light through a mask onto a stream of flowing building blocks, or oligomers. Wherever the light strikes, solid polymeric particles are formed in the shape of the mask, in a process called photopolymerization. During this process, the researchers can also load a fluorescent probe such as an antibody at one end of the dumbbell. The other end is stamped with a barcode — a pattern of dots that reveals the particle’s target molecule. This type of particle can be useful for diagnosing cancer and other diseases, following customization to detect proteins or DNA sequences in blood samples that can be signs of disease. Using a cytometer, scientists can read the fluorescent signal as the particles flow by in single file. “Self-steering particles could lead to simplified flow scanners for point-of-care devices, and also provide a new toolkit from which one can develop other novel bioassays,” Doyle says.